It’s Transportation Secretary Ray LaHood’s birthday, and he’s spending it testifying before the House Transportation Committee. The hearing is on “Mistakes & Lessons Learned” from the high-speed rail program, but — no surprise here — LaHood and House Republicans have differing ideas about what “mistakes” have been made. Chair John Mica said he’s a “strong, committed advocate to high-speed rail service in the United States” but he’s been “very disappointed” in the progress so far. “We have hit an impasse,” he said. Mica pointed to the ballooning cost estimates for HSR in California and reiterated his long-held position that it’s the wrong place to build high-speed rail. LaHood agreed that “this is an expensive project, but all of the money is going to American workers to build American infrastructure.” Mica stood firm that the Northeast Corridor, not California, is the place to build. “We’re taking our cues from you,” LaHood said. “We’re investing in the Northeast Corridor.” Mica said they’re still waiting for the money to be awarded. Rep. Bill Shuster, who chairs the rail subcommittee, said the president’s vision to bring high-speed rail access to 80 percent of the American people isn’t realistic. He said there’s no money for it — and no need. “I don’t hear people all around the country clamoring for high-speed rail,” he said. When LaHood said that the HSR vision isn’t “Ray LaHood’s vision” — it comes from the states themselves — Shuster said yes, but his daughter wants a luxury SUV and he don’t have the money for it, so she’s not getting it. 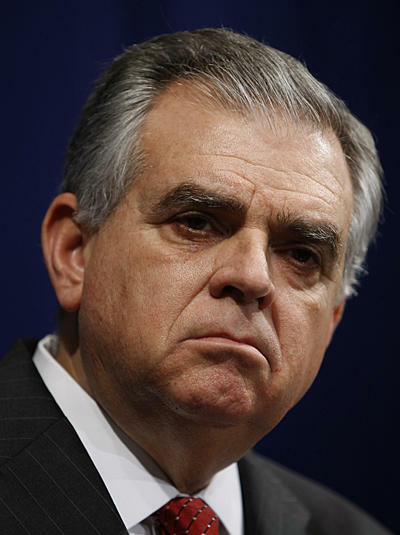 “I’m glad you didn’t think that about the Keystone Line,” LaHood shot back. He said Shuster asked for the money for that line and the DOT gave it. “Right,” Shuster said, I believe in rail investment “where it makes sense.” But, Shuster noted, he didn’t ask for help funding rail improvements between Harrisburg and Pittsburgh – and that line goes right through his district. But it’s not a strategic investment priority for the country. Shuster suggested actually taking money from the California project and putting it toward the NEC — not likely to be a popular suggestion, when federal funding is already just $3.6 billion of California’s $98.5 billion total bill. LaHood also said that it was Republicans who initially laid out the first few HSR corridors and he lamented the end of bipartisan cooperation on transportation, and high-speed rail in particular. He dumped all available funding for HSR into the high cost NE Corridor as a ploy to starve other regions of our nation from funding that could’ve been used to more pragmatically upgrade regional passenger service. Mica is part of the problem, not the solution. Where LaHood is absolutely right is that these trains will be fast enough to do a great deal of good; Amtrak’s Lincoln service, Piedmont service, Lynchburg Regional are already showing impressive ridership growth at their current 79mph track speeds & 50-55mph schedules. The fraud is that in order to gain broad delegate buy-in, the President promised 13 projects throughout 31 states – a $500B-$1T undertaking – with only $8B to back it up. A realistic approach would have been to focus on one project and make it a success. Given the lack of funding, FL was probably the only one Obama could afford, but at least Mica is realistic in terms of focusing on the one corridor that actually could make money. But Steve Jobs didn’t ask for billions of taxpayers’ money to develop the iPhone. High-speed rail in the US: dead man walking. Good riddance. Oh yeah, Silicon Valley wasn’t formed on Government investment at all, it just popped up out of nowhere. Guess who figured out how to use the mouse to it’s best ability, Steve Jobs. Don’t give me this crap about taxpayers not investing in anything. Everything has help. look, the only thing regulating land train speeds are people, people limit people and given this great country’s resources in ganging upon certain criteria with a getter done approach, there is simply no reason people could not be makign fair profits and incomes doing the right things by designing the right applications over the right geo location for the rigt reasons. who ever said we needed to utlize existing rail design systems…what a fraud… people wake up, we all need to re-begin thinking otuside the boxes where everyone shoudl be on page with a non-partisan group / agency overseeign design and developments for Americas central core of infrastructures that incorporate man things into one egreess ingress. jsut makes sense nto to meanion what this country is really capable of when they put greed asside. retired navy ships revamped into subsea plastic trallers / recyclers + new tech design trains cold lev ro micro grav rail systems, pathways incorporated into northern southern east west border structures as well as HSR shipping, power grids, massive solar collections mounting areas and buss ducting on the southern corridors. Folks we really need to re-think real fast real logical to all we’re doing and do it with assuredenness and accuracies.. The only thing Mica is right about is the idea that calling medium speed trains “high-speed” will give a bad name to HSR in the US. Image here is probably just as important for the long-term success of HSR in the US as the technical aspects of the trains/routes themselves. I don’t doubt that increasing travel speeds incrementally on some routes is a good thing, particularly if there is no funding for a dedicated HSR line. Fine, but don’t call an upgraded conventional rail line “HSR”. It isn’t. The definition of HSR starts at anything greater than 125 mph. Such speeds generally preclude diesel motive power. The general public is likely to be very disappointed going to ride an so-called HSR line, only to find a string of Amfleets being propelled by a P42 diesel locomotive. That’s not high-speed rail by any stretch. Heck, at least let’s not call a railroad HSR unless it’s electrified. AEM7s pulling Amfleets may not technically be HSR either, but they’re close enough that most of the general public wouldn’t care, at least in the short term. And yes, major investment in the NEC is needed. If we could make this corridor a showpiece running real HSR at, say, 160 or 170 mph for much of the route, then that will whet the appetite of other states for HSR. The goal of bringing high-speed rail access to 80% of Americans isn’t unrealistic if we think of the project the way we thought about building the Interstate highway system in the 1950s. It may cost $1-2 trillion, and take 20 years to build, but the effect of HSR on the country would be dramatic. Gone would be the need or rationale to drive long distances for the majority. Once few people drive over 100 miles, the “need” to build overpowered gas guzzlers vanishes. Electric cars would serve 99% of the driving populice. And we probably could let many of the lesser used sections of Interstate highway return to nature. Why would anyone drive when they could take a train which gets them there in half the time (or less)? Also, domestic air travel would decrease very dramatically, to the point a place like NYC might be able to close 2 of its 3 major airports, plus downsize the remaining one. HSR investment will easily pay for itself and then some by reducing the external costs associated with a road-based, fossil-fuel based transportation system. When looked at that way, it’s more costly long-term NOT to build it. Building Highways and buying cars is WAY more expensive than High Speed Rail ever will be yet these tired fools keep using the “it will cost too much ” excuse. Initially HSR will be more expensive than building a new highway, but over the long term it is the MUCH smarter investment. HSR tracks need much less maintenance and will take many cars off the roads and planes out of the sky. I can see how some redneck in the sticks would be against it, but this method of transportation really is the future, not highways which are already a HUGE tax burden and getting worse as they clog with more traffic. Living in a finite sized world with 5 billion+ people not everyone can own a pickup let alone multiple vehicles.